Well it finally happened. The stars aligned and I happened to be at mum’s house when she made lasagne, with a camera in my bag. Yes, I did invite myself over. Yes, I did suggest we have lasagne for dinner. And yes, I bought my camera with the intention of blogging about the entire experience. So, I guess it wasn’t so much fate, rather more like imposition. 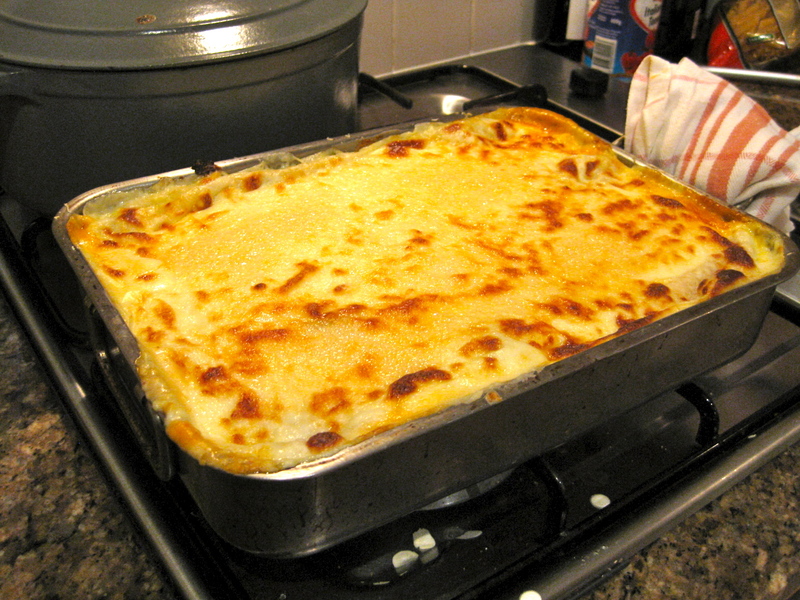 I know it doesn’t look the way most people would expect lasagne to look, and yes, it was a particularly runny batch. However, I actually think it is the abundance of fluid in my mum’s lasagne that makes it the delight that it is. It’s not really about the sheets of pasta that lay in between, it’s about the bond of love formed when bolognaise and bechamel mingle on the plate. True love. There is always a splendiferous amount of this meat and sauce swimming around on the plate after the last mouthful and it makes for great dipping with a crusty bit of bread or even just for eating; with or without utensils. This is definitely a plate-licker-meal. I will use this opportunity to include our family’s idea of bolognaise. I think me, mum and VC all make it more or less the same. I won’t include the details of bechamel, just a guide. You know how fond of them I am. 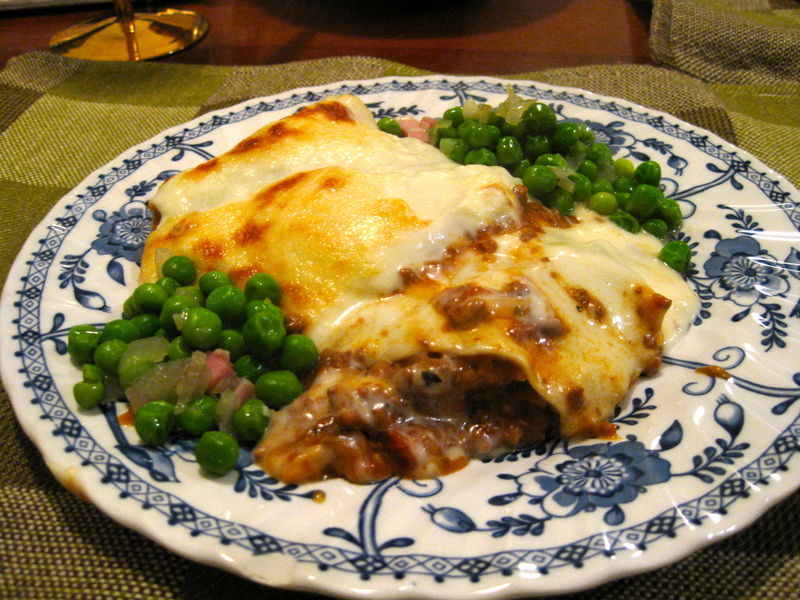 But I will include the layering technique that makes mum’s lasagne truly the best in the land. 500g Beef Mince (probably 1kg for a big one). Saute onion and garlic in a pan. Add tomatoes and herbs and season to taste. Cover with water and bring to boil, then simmer for an hour or longer. Thicken with a paste of flour and water. Make sure there is plenty of fluid in the bolognaise, a nice gravy-like consistency. Pour a full kettle of boiled water into a baking dish and soak the lasagne sheets in there for a few minutes. Then take them out and lay them out, for ease. 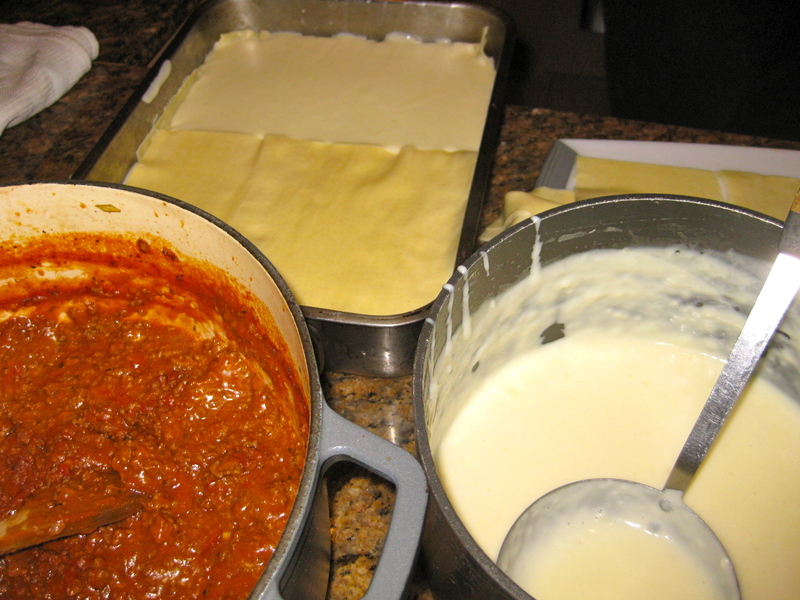 Spray or brush baking dish wish some oil and lay the first layer of lasagne. Put a layer of meat. Then another layer of lasagne sheets. Then a layer of bechamel. Then meat, then pasta, then sauce. Until you run out or the dish is full. Make sure your top layer is bechamel. Sprinkle with some parmesan or cheddar cheese. Bake in the oven for about an hour, or until golden brown on top. Some might think the bolognaise recipe is simple, and yes, it is. But it always works, and tastes good. It doesn’t have an overpowering tomato acidity as I find is a problem with many lasagnes. But if you want to ramp up the flavour you can always simmer it with beef stock or add spices like celery salt when sauteing the onions, or adding a bay leaf while simmering. In regards to the bechamel, again, it’s a simple recipe, and again, it works. The simplicity of flavours results in a dish that is not over powering or overly rich. But, if you like you can add a dash of nutmeg and a bay leaf to your sauce, or you can use a mixture of cheddar and Parmesan. Ideally, you should use fresh lasagne sheets, but if you can’t get any, then make sure you boil your pasta sheets until they are cooked. This is important. It is also important to layer as I specified. It makes a difference. The longer you let the dish sit, the better it will set. If you serve up straight away it will be quite runny. But like I said, that is not a bad thing. On the contrary, I feel that is exactly what makes this recipe work. Thanks mum for letting me share this recipe with my friends, some of whom may have had the good fortune to sample in the past. And thanks for dinner last night. How could I not comment on this post? I’ve had dinner, but suddenly I’m starving!!! It looks so delicious and I’ll put that on my list of things to make, when it’s more than just A and I!! Can’t wait to eat it tonight. I’m sure its another winner!